Steve Stevens: The Right Way to Play Billy Idol's "Rebel Yell"
Steve Stevens spill the beans about the lick's bluesy roots—and shows you how to play it correctly. Dual-voiced design offers four pitch effects, expression-pedal-like control. New offering captures sound of classic Roland Juno-60 synth. 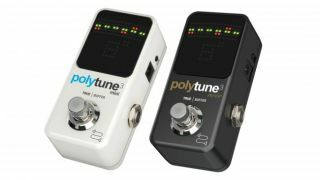 TC Electronic has announced PolyTune 3, the latest evolution of its polyphonic tuner pedal. TC Electronic has announced Paul Gilbert’s newest TonePrint, In-A-Gadda-Da-Vida. There is no better way to add meaty heft to your guitar or bass signal than an octave pedal. Of the many pedals available in this category, I really dig TC Electronic’s brand new Sub ‘n’ Up Octaver. Guitar World presents 20 of the best new delay and reverb pedals—and a few tried-and-true standbys no guitarist should be without.